In the soap challenge club we are making soap dough for this month’s soap challenge. 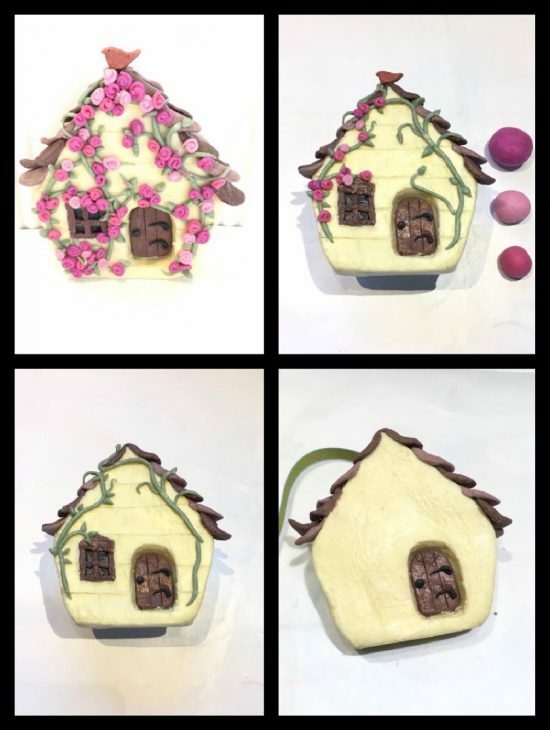 Tatsiana Serko, of Creative Soap by Steso, is our teacher and Amy Warden at Great Cake Soapwork is our host. The part that wasn’t fun was all the time I spend in my car driving around looking for oils for this dough project. It was just impossible for me to get what was recomended, so I ended up using some of my scented porcelian soaps with kaolin cley – probably not the best, but better than driving around like crazy, and in all kind of shops asking for oils that no one eaven had heard of…. My soap dough wasn’t anything near polymer cley or like Tatsiana’s dough, but I must say I did behave quite well – with that said it was far from perfect! In the making and the coloring of the dough I used a rolling pin and added mica while rolling. It was just like making puff pastry, roll, add mica and fold the dough until a nice even result. This is not the first time I’m playing with soap dough, but I have always used my soap «as is» in all my soap dough project. 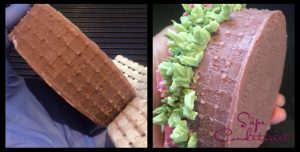 In may 2015 the soap challenge club was making soap dessert cakes, and some of my cakes had soap dough elements as part of the soap. I used a zester to grind my soaps and it worked well. It’s been a while since I’ve posted anything here so now I just have to share one of my soaps made last year. 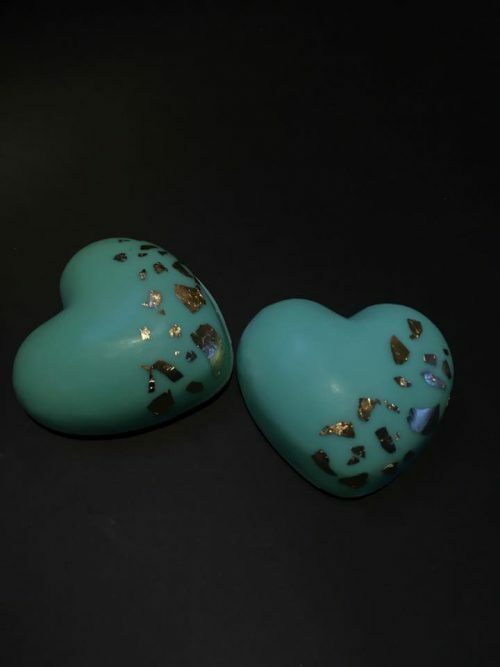 My Tiffany Heart Soap is one of my soap for the 2017 jewlery soap line. 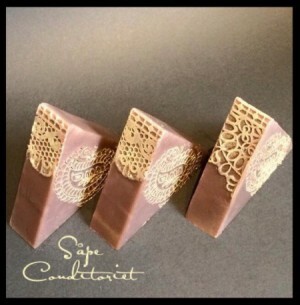 The soap is decorated with gold leaf and scented with BB’s Apricot Freesia FO. This is a soap where color and scent have found each other. 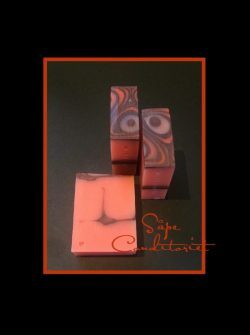 The fragrance is a upbeat blend of fruit and floral so it fits this soap so well. We are doing the Cosmic Wawe in november Soap Challenge Club, hosted by Amy Warden at Great Cake Soapworks. This is a fun and beautiful technique created by the talented Tatsiana Serko. Tatsiana is also this months guest teacher. Thank you once more for sharing of your knowledge, you really are a true artist! What is a cosmic wawe? This is what I found on the internet: A cosmic wawe is thought to be a space-quake, produced by something big like a supernova, a black hole or the collision of two neutron stars. It’s similar to what happens when something large is dropped into the ocean – it sends a wawe of water across, making tidal wawe and tsunamis. This is only a theory and has yet to be occure to be recorded. With that in mind I knew I had to go to outer space to see if I could find a cosmic wawe, or a least some inspiration for colors…. As usual I went along with my standard recipe – sometime it’s best to stick to what you know so there won’t be any surprise…. My recipe is a little heavy on hard oils, but the soapbatch behaved well and so did my FO, Grapefruit Bellini, no discoloration or speeding up trace so there was enough time to pour the soap. It’s a 5 color soap and the cobber mica really gave a nice effect – sorry it doesn’t show in my photos. The soap was placed in layered stripes so I gave the mold a couple of spinnings to achive the «wawe». I was thinking of doing the CPOP, but the soap ended up in my insulation box over night. 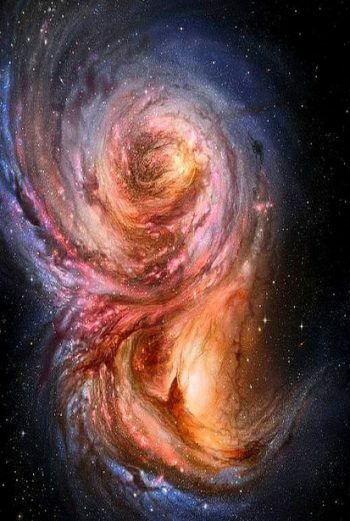 My inspiration photo is this beautiful galaxy and it’s colors. 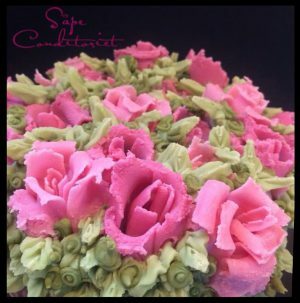 Another fun challenge, and the best of all – we got to play with different type of piping techniques. 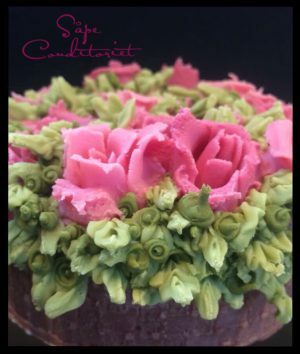 I have done a lot of (cake) piping but I have never used Russian piping tips, so I decided to try them for this soap challenge. I chose to do roses with two different rose nozzels. I also used a smal leaf nozzel and a tiny calligraphy nozzel. 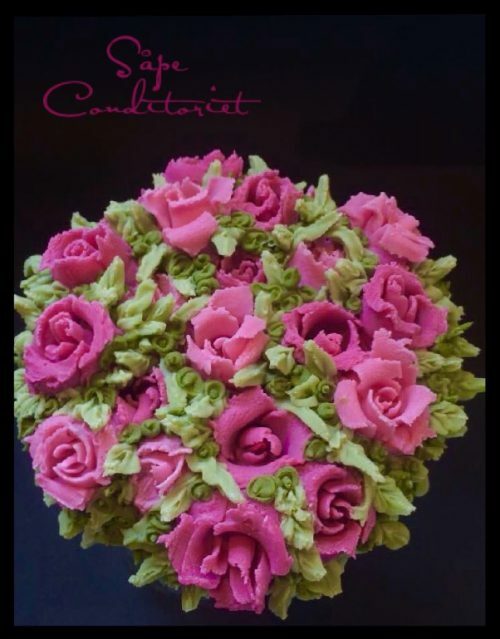 The idea was to make a «basket» and fill it with roses. I guess I got carryed away with the flowers, and leaf – well, I had to use all the soap in my pipingbags, or….? I used a knitting needle to bend the rose petals so they wouldn’t all look the same. This is my first attempt at soap piping and I must say I enjoyed «slow soaping» for a change. 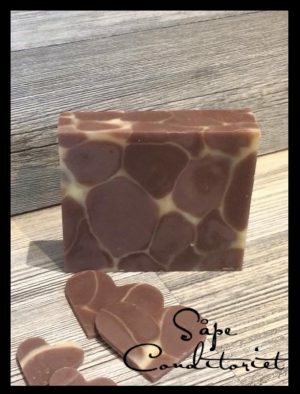 I used my standard soap recipe and added some beeswax. Soaping at 38 degrees celcius to thick trace, then poured the soap in my pipingbag and put them to rest for aprox one hour. As recomended I didn’t use any fragrance in the flowers. The «basket» is scented with BB’s Black Amber And Lavender FO. 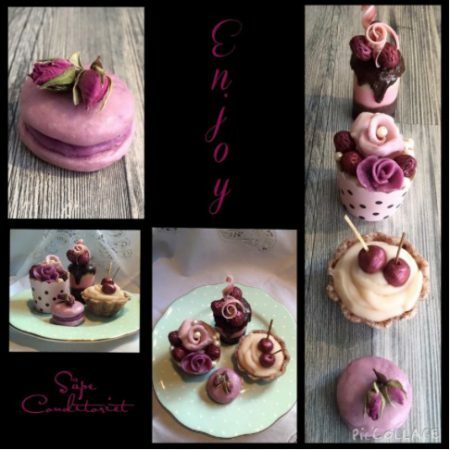 It’s been a while since my last soap challenge so I’m really happy to participate this month, and most of all – this is a great technique witch I will be using in my future soapmaking – and of course, I will practise some more…. I managed to keep a light trace during the whole prosess and the soap was wrapped and OP for an hour and then left «to sleep»over night. The FO is just beautiful and acted well during the whole prosess. As you can see the gold mica «got into» some of the browne parts – but, overall I’m happy with the result! This is my first soap, all natural colored with Bamboo Charcoal/Indigo and a EO blend of citrus too keep the trace under control! My rehearsal soap was so pretty, but the next one… What happend with the Indigo, it turned out browne and then slightly green….? 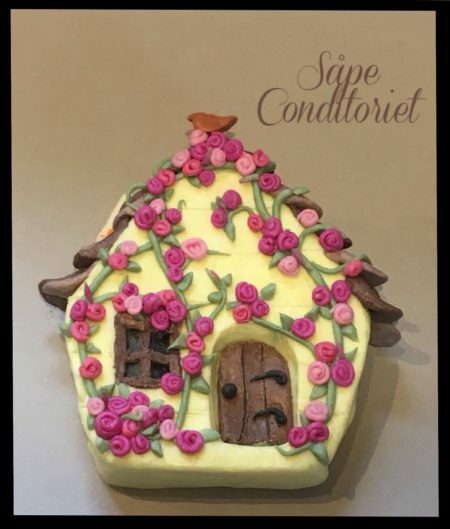 This was supposed to be my entry for this month’s soap challenge, but I had problems uploading my pic so I didn’t participate…. The colors and fragrance, Orange Blossom, is beautiful together. Faux funnel pour on top of the soap. Trying out my new wooden mold….. I make stuff. I sell stuff. I blog about it. I often give out DIY tips. Join me! For the love of soap and the air we breathe!